← Sale Alert! 7 iPhone and iPad Apps on Sale Right Now That You Shouldn’t Miss! 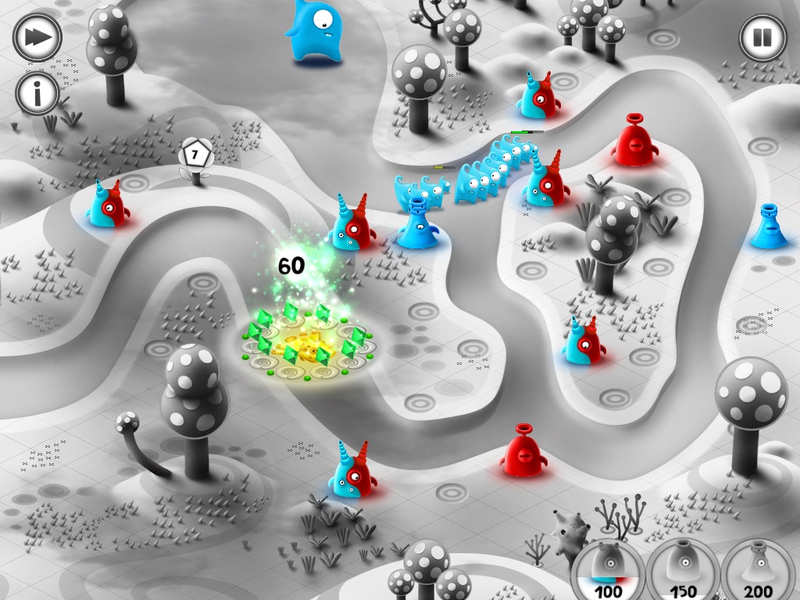 The basic objective of the game is to defend a group of green crystals against the monster invaders by placing colored jelly “towers” on specified spots along a fixed path. However, these invaders don’t always travel along a single path and maps are designed so they can pass through different routes at varying speeds. 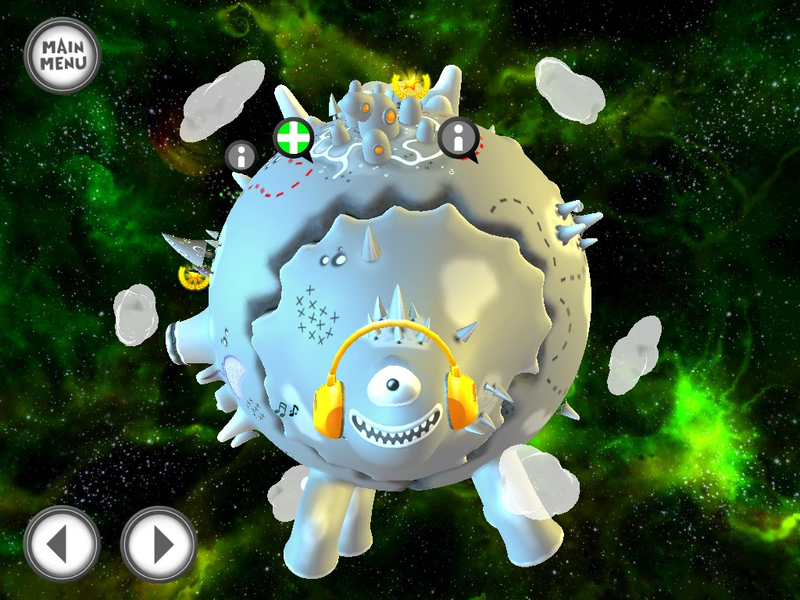 On the surface, Jelly Defense adheres closely to basic TD mechanics, with upgradeable jelly “towers” placed on a fixed path, power-ups and boss fights. However, there are subtle twists to the core gameplay which make things more challenging but, at times, occasionally frustrating. One interesting twist is that colors play a big role here. Towers can only shoot down monsters of the same color, and while there is a basic kind of tower that can shoot both, it’s relatively weaker than the others. This is a very interesting twist and makes it important to consider strategic placement of your towers. Another interesting aspect is that even if the monster has run off with one of your crystals, a strategically placed tower can still shoot down that monster and you can reclaim that crystal by tapping on it. 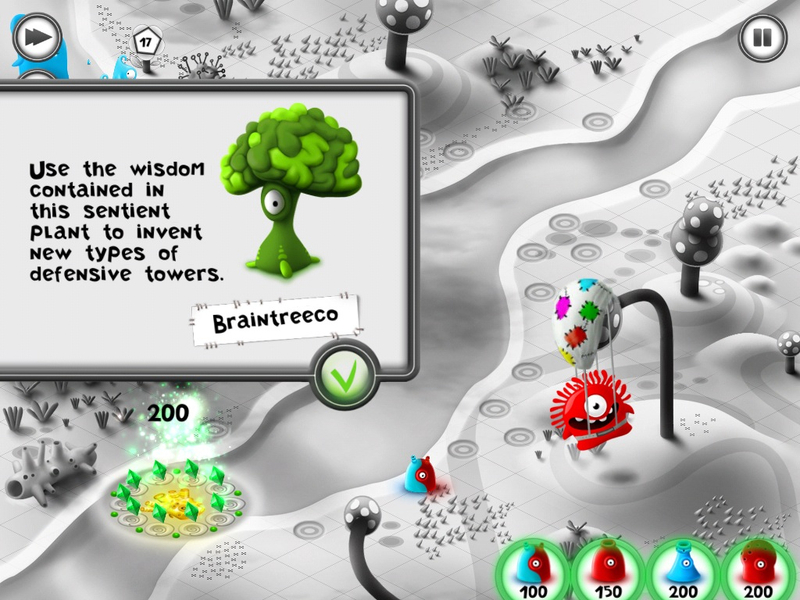 In higher levels, you need to use the inventor tree to access and build more sophisticated towers, which is done while playing a level. This is a bit of a hassle especially when you’re not familiar with what the tower you’re building is supposed to do. 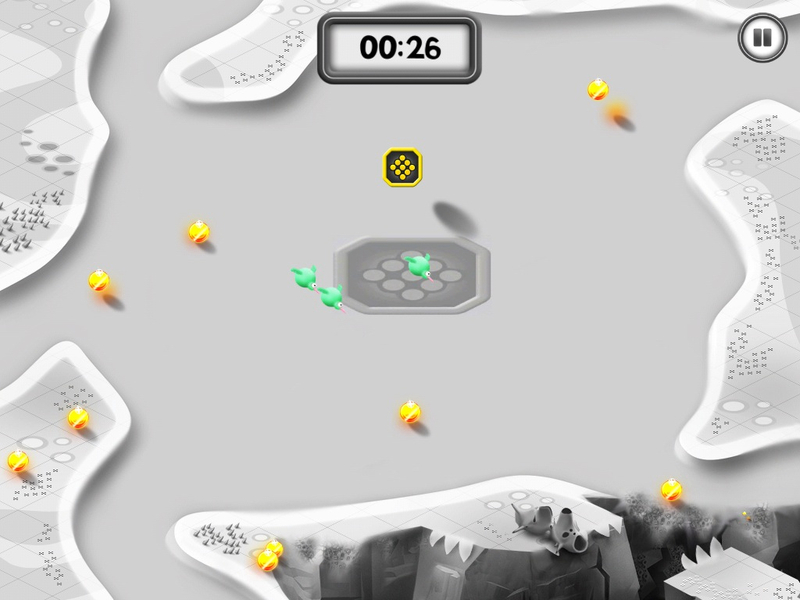 There are simple mini-games in between and power-ups that appear in the middle of the game, nice add-ons to vary the gameplay. Limited resources also play a role here, and on top of having to gather coins individually from each successful hit by tapping in various locations, more often than not, you will be forced to sell towers and build new ones mid-game just to survive. That, on top of the fact that you can only place towers in predetermined locations is my biggest gripe against the game. I pride myself in thinking of a long-term strategic gameplan that should be able to withstand waves of enemies without having to constantly sell and build towers mid-game. I honestly don’t know if the developers ought to change some aspects of its core gameplay, but I do hope that at least, they let the player be free to choose where the towers ought to be placed. There shouldn’t be a right or wrong answer in where you should place and what kind of towers should be put, as otherwise, Jelly Defense becomes more of a puzzle type of game than a legit TD title. This inherent limitation weakens the gameplay overall, and should be scrapped altogether. Still, despite these flaws, I like these little twists to the gameplay as they introduce a subtle, but different approach to how you normally play TD games. The controls make full use of multitouch, and the drag-and-drop intuitive approach really works. I do have a minor quibble, though, with respect to pulling up the upgrade/sell options, which requires a long press and yet another one to sell a tower. Since selling and upgrades at the right moment are critical to Jelly Defense’s core gameplay, the current control set up is rather time consuming. Considering that you need to tap on coins all over the place to be able to gather enough resources, sometimes the screen gets a little cluttered. A mechanism to gather coins or simplify the tapping process would be really helpful. The quirky jellies with their crisp, bright colors stand out against the greyed out landscape and the wiggly and the animation behind these these wiggly creatures is just smooth. The music is also amazing, and one I would even like to have as separate songs in my music collection. For the art and music alone, the game is already a joy to play, and is unlike any TD game I’ve played. 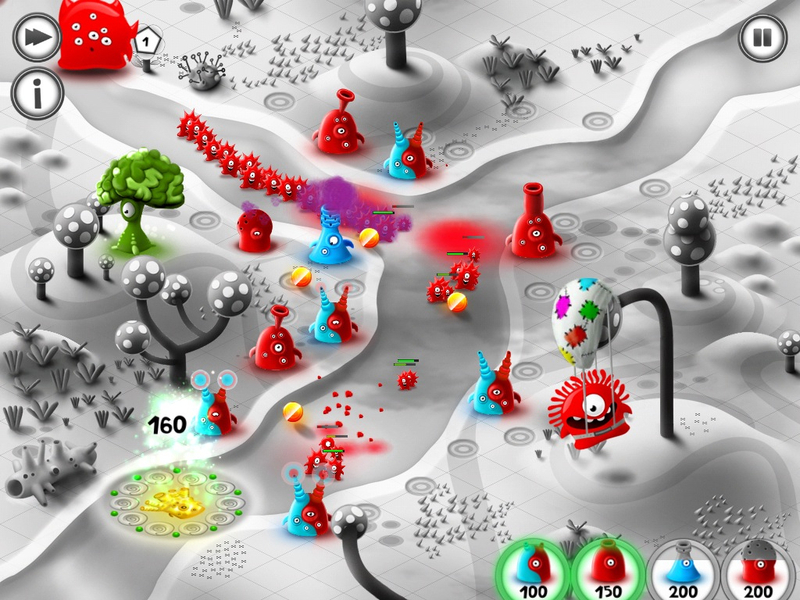 Jelly Defense will likely be compared to the quirky and cute TD classic title, Creeps, as its nearest kin and as a huge fan of the Creeps, I’d say Jelly Defense stacks up favorably despite some flaws in its game mechanics. No less charming and endearing are these jelly defenders, which make you feel somewhat responsible for their fate, and you just want to do your best, somehow to finish the level without losing a single crystal (which is oftentimes, a tall order). The addictive part of the game is when you’re quite far gone in the level and you think you’re going to come out unscathed … Until a tiny little monster runs off with your crystal. I have restarted each level so many times, I daresay I am prolonging the replay value of this game, which only amounts to 22 fairly lengthy missions. I do hope that endless mode will be provided in future updates and/or additional levels will be introduced for free or as in-app purchase – I will be more than happy to support the developers for setting the initial price so cheap. Jelly Defense is highly recommended for the art and music alone, and at the introductory price of $0.99, it is definitely a steal. More discriminating TD connoisseurs are nonetheless encouraged to take Jelly Defense for a spin – it’s likely an experience you won’t easily forget.